Under the loving guidance and direction of the Holy Spirit, the Religious Education Program here at St. Aloysius endeavors to educate the minds and hearts of the children enrolled-regardless of race, color, creed or special needs-and to provide an atmosphere that will encourage the development of their spiritual awareness. As Catholic Christians, we are called upon to practice and reflect on the love that Jesus the Christ has for us. Ever mindful that faith development begins within the Christian home-parents being the primary example of moral principles and values-mutual cooperation is needed to achieve our challenging goals. Trusting in God’s special love for each one of us, we are reminded of his promises-with God all things are possible! Online forms are for New Registrants. Returning families to use the pre-filled forms. 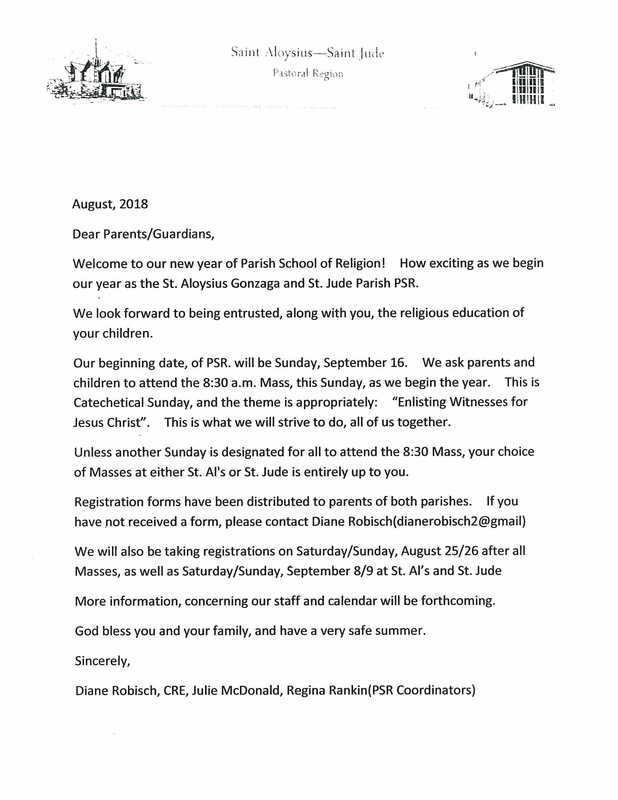 Registration forms for religion classes for our young baptized parishioners in grades 1-8, who attend public schools, and for our even younger parishioners, ages 3, 4 and 5 can be sent or put in collection basket along with the registration and book fees. You can register at the rectory office anytime. The fees for grades 1-8 are $65.00 – one child; $85.00 – two children; and $105.00 – three or more. There is a book fee of $15.00 per child. There will be a Sacrament Fee of $20.00 for 2nd grade. The Early Childhood Program is $40.00 per child. Registration after September 18 will be charged a late fee of $15.00 per child. If you have a child older than 7 who has not been baptized, please fill out the form and send it to the above address. Someone will contact you.